One of those odd nights when I had to cook dinner for myself - which literally translates into 'I can cook anything I want without worrying about how it will turn out'. But I wasn't in the mood for any elaborate culinary experiments. So I pulled out one of my cookbooks; hoping to find something interesting yet easy. And this is what I ended up with. The recipe says - "A mildly flavoured vegetable made with very soft paneer"; and the dish lives up to that expectation. Very easy and extremely mild (we are barely using any spices in this dish! ), it was so easy to make and I was pleasantly surprised at how good it tasted with rotis. Grind the onion, garlic, ginger and cashews into a fine paste. Heat oil in a wok and add the cumin seeds. When they begin to sizzle, add the ground paste. (Wipe clean your blender jar with little water and add this also; will give you the right consistency). Fry well till the raw smell and taste of onion disappears. Add the garam masala and salt. Add the paneer cubes and milk. Cook for few minutes. 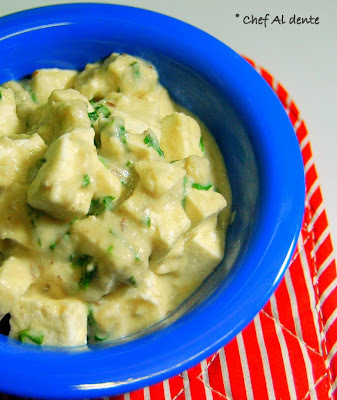 Stir very gently till each paneer piece is nicely coated with the gravy. Garnish with coriander and serve hot with rotis. Nice rich gravy with paneer.. This looks delicious. I am sure the flavours are mellow and the hint of coriander must be refreshing.